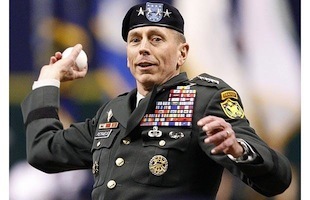 Iraq Commander turned CENTCOM Commander turned Afghanistan Commander turned CIA Director David Petraeus spent the weekend unemployed, having resigned on Friday in the face of evidence he gave his girlfriend access to classified data. But despite what one would figure is a wide open schedule, with his government career in tatters and his political future presumably dead, indications are that the “retired” general is “too busy” to testify on the September 11 attack on the Benghazi Consulate. But the scandal surrounding both the literal and figurative Petraeus Affair continues to grow with or without him, and has even has a potential Benghazi link now, with the discovery that Petraeus’s girlfriend Paula Broadwell recently made a claim that the Benghazi attack was centered not on the consulate but on the CIA safehouse, which she insists was housing detainees. The CIA denies this, but a claim that was totally ignored at the time because there was no reason to take Broadwell’s word for it, is getting a lot more attention now that it is known she had classified documents on her personal computer and could well have had inside access on the CIA’s info on the attack. Broadwell’s classified data access is also having fallout beyond Petraeus now, witheyes turning on Attorney General Eric Holder, who knew about the investigation for months but reportedly kept it a secret until the end of the November 6 election, at which time he told DNI James Clapper, who advised Petraeus to resign. There was already a lot of anger about the FBI not coming forward with information to Congress about the investigation as soon as it was apparent that there was a national security component, but if it turns out the Justice Department deliberately kept it under wraps to avoid any political fallout before the election, the scandal is even bigger. And that could be the tip of the iceberg. If Broadwell’s claims about the CIA holding detainees in Benghazi also turns out to be true, that whole separate scandal is potentially far bigger, as keeping that secret, along with the administration’s already shaky history of truth-telling on Benghazi, could suggest there really was a cover-up in the wake of the attack on the consulate, that the Obama Administration lied about ending the use of CIA black sites, and got their own ambassador killed in doing so. The possible fallout of all that, even coming after the presidential election, is virtually unfathomable, and as a part of the story continues to center on a sordid affair the real information about very really issues seems to be coming out as well.